Co. Kerry: Aghadoe (2), Currans (2), Kilcummin (2), Killarney (4), Kilbonane (2), Kilcoleman (2), Killaha (2), Killeenteran (2), Killorglin (3), Knockane (2), Molahiffe (2), Nohoval (2). The population falling within the Union at the 1831 census had been 57,166 with divisions ranging in size from Currans (population 2,531) to Killarney itself (11,333). 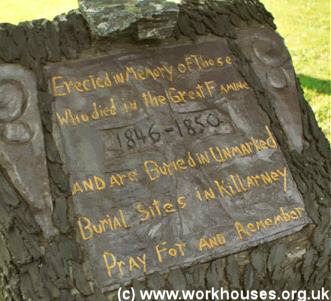 The new Killarney Union workhouse was erected on a eight-acre site half a mile to the north of Killarney. Designed by the Poor Law Commissioners' architect George Wilkinson, the building was based on one of his standard plans to accommodate 500 inmates. Its construction cost £7,350 plus £1,200 for fittings etc. The building and operation of a workhouse had to be financed by the ratepayers of each union and in many places was seen as an intolerable imposition from England and its officials. It took until 17th August 1844 to raise the first poor rate in Killarney, with the workhouse being declared fit for the reception of paupers on 2nd November, and not receiving its first admissions until 5th April 1845. The site location and layout of the Killarney workhouse are shown on the OS map from the early 1900s. Killarney workhouse site, early 1900s. The workhouse entrance lay at the south-east of the site. Unlike the usual two-storey entrance and administrative block, Killarney appears to have had a pair of single-storey blocks flanking a central driveway. One of these probably contained a porter's room. The main accommodation block had the Master's quarters at the centre, with male and female wings to each side. The large wings at the west side may have been a later extension to the original building. 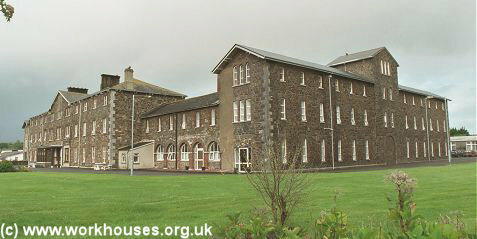 The former workhouse site is now the home of the St Columbanus Home which is the main geriatric care home for County Kerry. A stone now stands at the entrance to the site commemorating those who died and were buried in unmarked graves during the famine of 1846-50. The Killarney district lunatic asylum was erected in 1848-52 on a site close to the east of the workhouse, from where it may have received some of its patients. The imposing building cost £30,000 and by the early 1900s could accommodate over 650 inmates. Kerry County Library, Moyderwell, Tralee, Co. Kerry. Holdings include Board of Guardians' minutes (1840-1923).